Esk Valley Estate has been getting a lot of press attention in the UK recently. Their Reserve Merlot/Malbec/Cabernet for example, has just taken a gold” at the International Wine Challenge. Their winemaker Gordon Russell was in the UK and I caught up with him to taste through his current portfolio of wines and have dinner afterwards. Gordon is an instantly likeable character. Wiry and sharp in a bomber jacket and jeans, he has an encyclopaedic knowledge of Punk Rock and has a colourful, full-frontal enthusiasm for what he believes in: the Joe Strummer of the fermentation tank. Whilst by no means a traditionalist, Gordon does believe that certain painstaking and expensive methods are necessary to achieve the best results with his wines. Reds are matured in small open-topped casks with hand plunging of the skins both day and night throughout fermentation. He is also a constant experimenter, with different pruning methods, winemaking techniques and elements like barrels, yeast strains and vines. 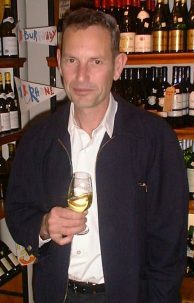 His Sauvignon Blanc in 1998 for example, was blended from no less than thirteen different component wines to achieve the result he desired.The model for his red blends – his personal benchmark – are the wines of Bordeaux. He is also keen to impart a local and personal stamp on the wines however: once again that combination of respect for tradition married to a determination to experiment and innovate. Esk Valley is situated in the Hawkes Bay region, on the east coast of New Zealand’s North Island. The region enjoys a maritime climate, with moderate winter and summer temperatures and rainfall, and a mild autumn allowing the grapes to hang longer and develop flavours and aromas. There are warmer nighttime temperatures than in the Marlborough region to the south and Gordon can usually rely on some beneficial Botrytis for his Chenin Blanc. Many of his vines are planted on shingle close to the beach with others on sandy river terraces further inland. Gordon is also a great believer that the potential for making world-class wines in New Zealand is only just beginning to be realised. He points out that 150 years ago all of New Zealand’s vineyard areas were nothing more than rain forest, so vines are the first managed crop to be grown. It is only 25 years since the first Sauvignon Blanc vines were planted in Marlborough. He believes that there has been a far greater understanding of vineyard management in recent years, so the reputation for rather green, herbal reds the country was once tarnished with should be a thing of the past. And so to the tasting. Guide retail prices are given in Pounds Sterling. Esk Valley wines are available from madaboutwine.com and from various specialist merchants around the UK. Consult the excellent Web site of their UK agent, Hatch Mansfield< for local stockist details. Very pale lemon/green colour. Very pure varietal nose with plenty of bright, crisp greengage and nettle, but also hints of pure tropical fruit aromas: pineapple and mango. On the palate it is quite full-bodied with a silky texture and a lovely creamy succulence. Good length, and balanced acidity keeping it fresh. A very nice style. 95% of fruit from a single vineyard. The fruit is fermented in small batches, each inoculated with different yeasts, some lees matured, some stirred, all to build complexity. Paler green/gold. A nice honeyed edge to crisp apple fruit on the nose, then again that little nuance of much riper, more luscious tropical fruit. The palate has a rich texture with ripe melon and peach fruit and a little vanillin note. There is plenty of crunchy green apple acidity too and the wine drinks well into a pure, clean finish. This comes from 25 year old vines and undergoes 50% barrel fermentation. Around 1% of botrytised wine is blended in and the lees are stirred to build up texture. Pale gold, again a green tinge. Big, powerfully-oaked wine on the nose with charry, Jack Daniels notes and suggestions of liquorice and toast. There is beautiful fruit too, which begins to emerge from beneath the oak: ripe pear and little sweet notes of pear-drops. The palate is richly textured and very silky with rugged spiciness, vanilla, good fruit and length. Finishes well with fine acidity. I think this will be even better with a couple of years in bottle to let the oak and fruit integrate more. Again, a variety of experimental techniques were used for this wine which comes from different parcels of vines across Hawkes Bay. Some batches were fermented with cultured yeasts, some with the bungs off the barrels to allow fermentation with ambient wild yeasts. Pale to medium gold. Subtle nose with hints of oatmeal, cream and vanilla over buttery peach and pear fruit. Complex, with floral notes and some minerality. The palate is very silky (the texture is a hallmark of these wines) with powerful, savoury, juicy peach and nectarine fruit, but there is lime and citrus too to keep it sharp with a pure core of fruit and balanced acidity. Long, cool, classy finish. Half the fruit from this wine comes from New Zealand’s earliest Chardonnay vines (now at 15 years old). Very dense, dark purple black. Attractive dark berry fruits on the nose with lots of cedar and pencil-shaving notes. There’s a core of deeply hued, almost baked fruit of great depth. Very creamy on the palate. Ripe and sweet black fruit and plum that gives a lovely bittersweet depth. There is some spicy oak and fine tannins and though quite foursquare, this has power, length and great personality. From a very hot year this is hand-plunged in small concrete fermenters before spending eleven months in French and American oak. Extremely dark and dense crimson/black. Leafy blackcurrant aromas add an edge to really solid, dense cherry and damson plum fruit with a dusty blackcurrant sweetness. The oaking is subtle adding a coffee-bean darkness. Quite rich and chunky fruit on the palate with masses of sweet berry and spice then an elegance as the wine stretches into a long finish with ripe, fine tannins and balanced acidity. Good concentration of fruit, this should age well for five years or more. 45% Merlot, 35% Malbec, 10% each Cabernets Sauvignon and Franc. From a cooler vintage, the fruit is from the best vineyards with lower yields. It spends 15 to 22 months in French and American oak barrels, around 60% of which are new.